30 St Mary’s Axe, more commonly known as The Gherkin, houses a range of companies across its 41 floors. 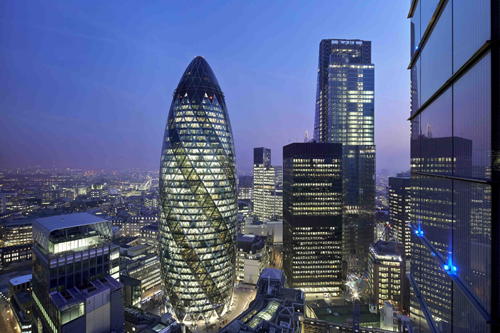 When it came to replacing the existing access control system, CBRE 30 St Mary Axe Management wanted a solution which could not only be rolled out seamlessly, but also allowed tenants to manage their own areas. Following a tender process, the firm worked with Grosvenor Technology and Universal Security Systems to achieve a tailored system using the SATEON platform. As a browser-based access control system, SATEON was deployed without the need for additional software to be installed on each of the tenants’ server space. The integrated system incorporates almost 200 card readers and SATEON door controllers and allows current door statuses to be viewed through a fully navigable map interface. A fully partitioned, Microsoft SQL backend database allows each tenant to manage their own area, including reports on staff attendance and identity card access, whilst CBRE 30 St Mary Axe Management maintain overall control of the building.